Retinol is an anti-aging powerhouse for skin—that’s why we love it! But, as good as it is, retinol is not the only ingredient you need for great skin. We formulated our 1% Retinol Booster so you can add a potent amount of retinol to any other product in your skincare routine, for enhanced, custom results that YOU control! Unlike other Paula’s Choice retinol products, 1% Retinol Booster is specifically formulated to penetrate faster and more efficiently, making it more effective when applied first; or you can add a few drops to your serum or moisturizer. With that in mind, we’ve put together five problem-solving "power couples" featuring our 1% Retinol Booster—each designed to tackle the skin concerns you worry about most. This combination of superstar ingredients helps restore a smooth, even appearance on rough, bumpy skin, while simultaneously refining pores. Both products also contain soothing agents to calm redness while their potent formulas go to work. Bonus: The combination of retinol and lactoperoxidase can help promote clearer-looking skin. How to Use it: Apply the 1% Retinol Booster first and then apply the RESIST Anti-Aging Clear Skin Hydrator over it. You can also use a Paula’s Choice serum as well, depending on your skin type. The serum would go on before the moisturizer. Whether struggling with seasonal dryness or a persistently dry, dull-looking complexion, you can replenish your skin with this intensely moisturizing skin-renewing duo. Our SKIN RECOVERY Replenishing Moisturizer provides rich emollients for an instant youthful glow and lasting moisture; the 1% Retinol Booster visibly improves multiple signs of aging and environmental assault that are causing skin to look dry, dull, and uneven. It is nourishing for sensitive and chapped-looking skin, even gentle enough for eczema-prone skin. More to love, this duo’s calming ingredients help temperamental skin handle the powerhouse retinol formula. 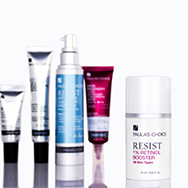 How to Use it: Apply the 1% Retinol Booster first and then the SKIN RECOVERY Replenishing Moisturizer over it at night. Uneven skin tone is often stubborn, but there’s a good deal of research showing that a mixture of skin-brightening ingredients and retinol are a winning combination for optimal results. Using this combination of our RESIST Pure Radiance Skin Brightening Treatment with the 1% Retinol Booster, supercharges your skin’s ability to renew and promote a more even-looking skin tone. That means you’ll see more dramatic results—even faster! This duo adds instant radiance as it works to improve your skin tone. But, don’t forget to apply daily broad-spectrum sun protection—the key to making sure more discolored areas don’t show up! How to Use it: Apply the 1% Retinol Booster first and then apply the RESIST Pure Radiance Skin Brightening Treatment over it at night. Follow with your nighttime moisturizer. As always, during the day, it’s essential to protect your skin with a broad-spectrum sunscreen as the last step in your morning skincare routine. What do you get when you combine an ultra-rich eye cream with the power of retinol? A truly dynamic duo that goes to the next level to combat wrinkles and other signs of aging, including dryness and loss of firmness. Even better, you can adjust the strength of this duo to suit your specific needs. This power couple includes proven emollients and skin-restoring ingredients as well as several potent antioxidants to improve skin texture while also helping to noticeably minimize the look of wrinkles and calm stressed skin. Did we mention that this ultra-concentrated combination keeps the eye area moisturized all night? You’ll wake up to smooth, supple skin around the eyes! How to Use it: At night, first apply the 1% Retinol Booster over the lines at the corner of the eye area and the "eleven" lines between the eyes. Then dab on (don’t rub) the RESIST Anti-Aging Eye Cream over those same areas as well as in the undereye area. What if you don’t have a specific skin concern, but simply want to slow the appearance of the overall signs of aging? Load your skin up with antioxidants AND a potent amount of retinol, which is exactly what combining our 1% Retinol Booster with any of our Super Antioxidant Serums will do! In addition to minimizing the surface effects from environmental assault, antioxidants can help minimize the look of more advanced signs of aging and renew skin’s smoothness. Anything you can do to relieve temperamental skin is crucial to your skin appearing healthy and younger! When you combine that with the power of retinol, it’s a game-changer for skin. We think you’ll agree each and every time you catch sight of your ever-improving complexion in the mirror!